Many of these incidents cause more than bumps and bruises. In fact, falls are the leading cause of emergency room visits in Tampa. They eclipse car crashes, painkiller overdoses, gunshot wounds, and all other kinds of injuries. Typically, the landowners are responsible for these and other injuries which occur on their property. Making a prima facie (preliminary) case for liability is usually a two-part process. Then, the tortfeasor (negligent actor) has an opportunity to present any relevant defenses. Invitees: If the victim had permission to be on the land and the landowner received a tangible, intangible, or potential benefit, that person is an invitee. Most people are invitees. In these situations, the landowner has a duty of care to ensure that the property is reasonably safe. That duty includes frequent safety inspections. Licensees: These individuals have express or implied permission to be on the property but the owner receives no benefit. Kids who take shortcuts across parking lots on their way to and from school are licensees. Owners have a duty to warn licensees about any latent (hidden) defects, such as a loose stairway rail. Trespassers: If the Tampa victim had no permission to be on the land and the owner received no benefit, the owner owes no duty in most cases. Some exceptions include the frequent trespasser doctrine, which the Florida legislature has sharply limited. Compensation in serious fall cases tends to be substantial. Damages include money for tangible losses, such as medical bills, as well as intangible losses, such as pain and suffering. Additional money damages may be available in some cases as well. To obtain compensation, both invitees and licensees must prove that the landowner knew about the dangerous condition. Sometimes, there is direct evidence of actual knowledge. That includes things like a written property inspection report or a “cleanup on aisle four” announcement. Circumstantial evidence of constructive knowledge (should have known) also suffices. Most states, including Florida, use a variation of the time-notice rule. This rule was first articulated in 1911’s Anjou v. Boston Elevated Railway Company. In that case, the victim slipped and fell on a banana peel. Witnesses described the peel as “black, flattened out and gritty.” Since the peel had been on the floor a long time, the court concluded that the owner had constructive knowledge of the defect. Tampa landowners are not responsible for damages, even if they know about them, if the hazard was open and obvious. This doctrine is very fact-specific. Essentially, both the hazard and the danger must be readily apparent to a reasonable person. A large display of canned goods in a grocery store aisle is probably an open and obvious hazard. A wet spot on the floor is probably not such a hazard, especially if it was clear liquid. 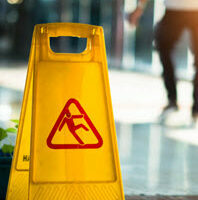 Landowners are usually responsible for slip-and-fall injuries. For a free consultation with an experienced personal injury attorney in Tampa, contact The Matassini Law Firm, P.A. Home and hospital visits are available.